Most of us know the discomfort and annoyance of a sinus infection. Especially when they linger on. But few people realize that there are rare cases when untreated sinus infections can turn serious. The first thing to realize is that all sinus infections are not the same. A sinus infection, a.k.a. sinusitis, can be either a viral or bacterial infection. The term “sinusitis” simply means that there’s irritation in your sinuses, which make up the lining around the air spaces between bones that surround your nose. Symptoms of the different strains are so similar that doctors typically recommend patients wait seven to 10 days before seeking treatment. Viral infections — the common cold — usually work themselves out in that period of time with nothing more than liquids, rest and perhaps Tylenol, Dr. Sindwani says. The main reason to prescribe antibiotics is for patient comfort, Dr. Sindwani says. The medical field used to be more convinced than it is today than untreated sinusitis would inevitably become a chronic issue, he says. Antibiotics also can help ward off rare but potentially dangerous complications that arise when a sinus infection spreads to the eyes or brain, Dr. Sindwani says. Complications around the eyes are the more common of the two. 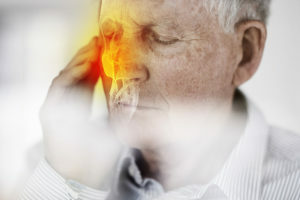 These complications can cause redness, swelling around the eyes and reduced vision, and even lead to blindness — in a severe form known as cavernous sinus thrombosis. Serious cases are immediately treated with IV antibiotics. Patients are usually admitted to the hospital for a CT scan to see if fluid needs to be drained, Dr. Sindwani says. It’s important to monitor your symptoms if you suspect a sinus infection. If the condition lingers or worsens, call your doctor.